Those words are found in 1 John 4:9, and are closely followed in verse 14 by these words, ‘The Father has sent his Son to be the Saviour of the world.' As was hinted in the last talk, about the visit of the Magi, Christmas is about incarnation. Earlier in Advent I was thinking about the idea of the Creator of the universe becoming part of his own creation. It seemed to me to be the ultimate in ‘downsizing'. That's a word people use when they sell their house and buy a smaller one to live in, for whatever reason. However strong one's imagination in envisaging possible examples of downsizing, there is nothing greater than that of God becoming a human being, of leaving heaven to live on earth. And to be born in a stable, what's more, not in a fine palace with all the trimmings of royalty. And this for the greatest of all reasons; to save humanity from its self-destroying lifestyle and to bring us back into a loving relationship with God, for now and forever. As I dwelt on these thoughts some verses began to form in my mind. not just in word, but deed! to arrive through human birth. That first verse, by the way, is not a description of what has happened to me. It is an imaginary scenario that reflects what a number of people have done in responding to Christ’s love and the needs of people they encounter in life on Earth. Some have quite literally sold up and moved among the people they feel called to serve. Some have gone to other parts of the world in order to share the love of Christ, sinking their whole lives into the endeavour. No doubt, you can think of some current examples. Christmas Day can be a lovely experience for most of us, as we come together as families and friends to enjoy good food and fun, and as we share Christmas greeting and presents. For others, it can be a very difficult day and it would be good for us to think of them prayerfully and to pray for those who devote their Christmas Day to cater for the needs of the less privileged members of our communities. They are, as my verses suggested, incarnating the love of God and the Lord Jesus. Let’s finish by thinking about the stable scene in Bethlehem. Mary looking at Jesus with a mother’s love for her firstborn child, and with deep thoughts about how different their lives would be from here on. Joseph, still with Gabriel’s words ringing in his ears, already slipping into the role of being father to God’s Son. The shepherds, alive with excitement and looking with wonder at the little baby whose future was to be so big. The Magi, kneeling before the one they know is destined to be more than a king, worshipping him in a manner that befitted their religion and understanding. It’s good for us to join them all around the manger, giving thanks and praise to God for the gift of his only Son. The Lord bless you today, and then as you move into the new year. Whatever it holds for you, if you’ve stood in the stable today, you will know that God will be with you and nothing is impossible with him. We began our journey with that promise. We’ve seen how it happened for these characters. There’s only one way to find out - trust him; he’s as good as his word. Greetings! This is Jim Harris with the 4th meditation on the Christmas story. I’ve called the series ‘Travelling Towards Christmas’ and we’re now going to think about the Magi, or wise men as they are popularly known. You might find it helpful now to read Matthew 2:1-18.
who will shepherd my people Israel.' "
7 Then Herod called the Magi secretly and found out from them the exact time the star had appeared. 8 He sent them to Bethlehem and said, "Go and make a careful search for the child. As soon as you find him, report to me, so that I too may go and worship him." Travelling Towards Christmas? Yes, that’s what these men were doing, and probably for quite a long time, for it seems they originated in what we now call Iran but used to call Persia. The Magi were sort of priestly group - not kings, as is usually supposed in traditional Christmas presentations. They were men who studied the night skies for signs of what was going to happen. We would label them astrologers today but they were more than that. They were aware of ancient writings and promises that had been made long before they were born, and looked to see where and when they would be fulfilled. Those who visited Jesus had seen a clear sign that an ancient promise was shortly coming to pass. With a bit of help from the Jewish scholars, the star took them to Bethlehem, where they found the young child with his mother. They brought gifts of gold, incense and myrrh. These three gifts may have suggested that there were just three of them in the party, but Matthew gives us no data on that. Gold, a gift fit for a king. Incense, a gift appropriate for a priest; still used today in some churches. Myrrh, a gift suggesting sacrifice and death, for it was an embalming spice. What other insights did they have, we wonder, as they travelled and talked among themselves. Matthew understood that they were significant to the story of Jesus birth, not just because they came, but because they were part of God’s strategy for Jesus. Those gifts were valuable, extremely so, and their value would have provided the means for the Holy Family to escape into Egypt and remain there for as long as it was necessary. This thought is strengthened by the fact that it was the Magi’s visit that provoked Herod’s wrath and his vicious massacre of the young boys of Bethlehem. There is something unexplained and mysterious about this visit of the Magi but, whatever else may be true, it makes the point for us that Jesus coming into the world was not only to save his people – that is the Jewish people – from their sins. Far from it; he was coming to be the Saviour of the world. His life, death and resurrection would establish salvation for all who would believe and receive it, regardless of race, colour, creed, culture, or social status. Perhaps these Magi were Wise Men after all, in that they partly understood what we’ve come to call incarnation – God on earth as a real human being! Hi there! 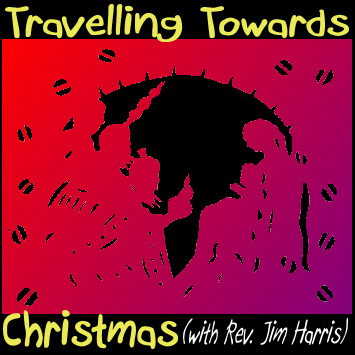 This is Jim Harris with the third talk in our series, Travelling Towards Christmas. Having previously discussed Mary and Joseph, this time we’ll have a look at the shepherds, who apparently were the first people to see the new-born Son of God, the one we now describe as ‘Our Lord and Saviour, Jesus Christ,’ This would be a good moment to read Luke 2:1-20, for that’s where we find their story. 4 So Joseph also went up from the town of Nazareth in Galilee to Judea, to Bethlehem the town of David, because he belonged to the house and line of David. 5 He went there to register with Mary, who was pledged to be married to him and was expecting a child. 6 While they were there, the time came for the baby to be born, 7 and she gave birth to her firstborn, a son. She wrapped him in cloths and placed him in a manger, because there was no room for them in the inn. The Shepherds and the Angels 8 And there were shepherds living out in the fields nearby, keeping watch over their flocks at night. 9 An angel of the Lord appeared to them, and the glory of the Lord shone around them, and they were terrified. 10 But the angel said to them, "Do not be afraid. I bring you good news of great joy that will be for all the people. 11 Today in the town of David a Savior has been born to you; he is Christ[a] the Lord. 12 This will be a sign to you: You will find a baby wrapped in cloths and lying in a manger." Shepherds were not sophisticated middle-class people. They were down-to-earth, rugged, hard working men, who tended and took care of flocks of sheep, mostly belonging to rich people. Some of them had a special role in looking after the flocks that produced lambs for the Temple sacrifices at Jerusalem. It’s known that these were pastured on the fields surrounding Bethlehem, because of it was close to Jerusalem. With that in mind, consider the fact that Jesus was to become ‘The lamb of who takes away the sin of the world!’ (John 1:29) Isn’t that remarkable? With these ideas in mind it’s good to reread verses 8-11 again. It all comes together into what we can only think of as God’s superb plan for introducing His Son to the world..
Then a little later we read, ‘Suddenly a great company of the heavenly host appeared with the angel.’ The message they brought was ‘Good news of great joy to all the people’ – the Saviour had been born in Bethlehem. It was made pretty clear to them that they were to bear witness to this tremendous event by visiting the Baby, then passing on the good news to others. What does all this say to us, as we approach Christmas by crossing Shepherds Fields? First of all, that Jesus is for all people. Good news of his birth was entrusted to what a poet has called ‘a few farm workers!’ News of his resurrection was entrusted to a woman with a dubious history, Mary Magdalene. Jesus is for everyone, whatever their social rank or moral background. He’s the Saviour – he specialises in forgiving the past and creating a new future for all who put their faith in him. Then, they did what was required of them. They went off immediately to find the Baby and confirm what the angel had said. They were eager to do what God wanted from them, which is a mark of true faith. Mind you, if we’d been among them, I think the excitement of heaven breaking through in the encounter with the angels and in the birth of God’s Son, would have sent us hurrying down to Bethlehem as well. Then, they told everyone what had happened. They witnessed to others about their experience and the message they’d heard. Another mark of genuine faith is that we become so thrilled with what’s happened to us, that we simply overflow. We tell everyone about it. That’s what happened with Jesus’ disciples about thirty three years after this. They just couldn’t stop telling everyone the good news that Jesus was risen from the dead. Finally, the shepherds glorified and praised God for all the things they’d seen and heard. They did not draw attention to themselves. They did not entertain a ‘special status’ mentality because God had chosen them for this important role in the nativity. It’s a mark of true spirituality that all glory goes to God for the experiences he grants us. Hello again. This is the second talk given by Jim Harris in our series, ‘Travelling Towards Christmas.’ It’s about Joseph, betrothed to Mary. We meet and learn about Joseph in both Matthew’s and Luke’s accounts of the birth of Jesus. He is the quiet man in the story but also a spiritual person who wished to live his life and make his decisions in accordance with God’s will. Please read Matthew 1:18-25. This is how the birth of Jesus the Messiah came about: His mother Mary was pledged to be married to Joseph, but before they came together, she was found to be pregnant through the Holy Spirit. Because Joseph her husband was a righteous man and did not want to expose her to public disgrace, he had in mind to divorce her quietly. But after he had considered this, an angel of the Lord appeared to him in a dream and said, "Joseph son of David, do not be afraid to take Mary home as your wife, because what is conceived in her is from the Holy Spirit. She will give birth to a son, and you are to give him the me Jesus, because he will save his people from their sins." All this took place to fulfill what the Lord had said through the prophet: "The virgin will conceive and give birth to a son, and they will call him Immanuel" (which means "God with us"). When Joseph woke up, he did what the angel of the Lord had commanded him and took Mary home as his wife. But he had no union with her until she gave birth to a son. And he gave him the name Jesus. Jewish society at that time had an arrangement for approaching marriage called ‘betrothal’. It was a kind of engagement period, in which the prospective bride and groom lived under the same roof but did not consummate the relationship sexually. That was reserved for their wedding day. Mary was pledged in this way to be married to Joseph. It is likely that he was older than Mary, as there is no mention of him during Jesus’ adult ministry. Perhaps he’d died before Jesus reached the age of thirty, which was when he went public. Joseph’s role was secondary to Mary’s; nevertheless it was an important one. It was also a dangerous role he had to fulfil. First of all, there was the possibility of public rejection and the stigma of Mary’s pregnancy during the betrothal period. Then there was the need to travel for registering at Bethlehem, followed by the flight into Egypt when king Herod went on the rampage at the suggestion of a ‘King of the Jews’ being born. Finally, there was all the caring and providing for the family’s welfare once back safely in Nazareth, a town that had its own social problems. Sometimes he is called the ‘caretaker father of Jesus’, given the responsibility of protecting and providing for God’s Son, for as long as was necessary. Joseph had some fine spiritual qualities and the one we’ll look at now is that of ‘sensitivity’. In the first place he was sensitive to Mary’s needs. He’d heard her side of the story but, even so, felt it necessary to divorce Mary because of apparently improper behaviour. But he didn’t want to expose her to public disgrace being, as Matthew puts it, ‘a righteous man’. Being righteous can sometimes carry a hard edge to it, but not with Joseph. With him, it carried a sensitive understanding of Mary’s situation. That may suggest that he wanted to believe her story but had no way of verifying it. Whatever, Joseph was clearly sensitive to Mary’s needs. He was not consumed with the selfish and self-justifying attitudes that characterise so much marital and pre-marital discord in our day. It is interesting that most of Joseph’s guidance came through dreams. Clearly that was right for him in God’s will, but the only certain way to know God’s will for our lives is to be familiar with the teaching of Scripture, letting experience confirm it in practice. We must be sensitive to God speaking through his Word. Finally, he was sensitive to the situation in which he, too, was placed and wanted to do only what was right in God’s eyes. He didn’t let the world around him squeeze him into its shape. His actions were not dictated by other people’s view of what constituted right conduct. Quite the reverse; Joseph took decisive action as a man of faith and principle. He did what the Lord wanted. We should admire Joseph and follow his sensitive example. Here’s another question to think about as we travel towards Christmas. Hello. My name is Jim Harris. I’ve been asked by Dave to provide some talks taking us towards Christmas Day. He’s also asked me to introduce myself so you know where I’m coming from. I’m a retired Christian Pastor, Evangelist and Teacher, having spent about 31 years in full time ministry. In the run up to Christmas it is inevitable that we begin to think about the characters involved in the original events surrounding the birth of Jesus. Where better to start than with Mary, to whom was given the great privilege and awesome responsibility of carrying and giving birth to God’s Son, the Messiah. Please read Luke chapter 1, verses 26-30. In the sixth month of Elizabeth's pregnancy, God sent the angel Gabriel to Nazareth, a town in Galilee, to a virgin pledged to be married to a man named Joseph, a descendant of David. The virgin's name was Mary. The angel went to her and said, "Greetings, you who are highly favoured! The Lord is with you." Mary was greatly troubled at his words and wondered what kind of greeting this might be. But the angel said to her, "Do not be afraid, Mary, you have found favor with God. Mary was probably a teenager when she received the visit from the angel Gabriel to tell her that the Lord had chosen her for this very special purpose. Hearing his greeting she was greatly troubled. Meeting an angel isn’t exactly an everyday experience. But there was something deeper disturbing her peace of mind – the content of his greeting. ‘You who are highly favoured! The Lord is with you.’ That set her on her guard. Whatever was coming next? Gabriel sensed her fear and told her she need not be afraid. He was bringing good news not bad. The time had come for God to send his Son into the world; to be born as every human being has to be born so that, in due course, he would become the Saviour that the world needed. Hence the name they were to give the child –Jesus - which means ‘God saves’. Just imagine the mounting excitement in Mary as he went on with his message. That was every godly Jewish woman’s dream; to be chosen to be the mother of the Messiah. It all sounds very cut-and-dried, when we read ‘You will be with child and give birth to a son and you are to give him the name Jesus.’ Despite the way it sounds, God wasn’t forcing Mary into this role, but he knew her heart well enough to realise he’d get a good response. We have an insight into how she thought and felt about God in the song recorded by Luke in verses 46-55. She knew the Old Testament Scriptures well and used them as a basis for her outpouring of praise and thanksgiving. Mary was a spiritual woman, however young she might have been. She loved God and wanted the best for his people, which isn’t a bad description of spirituality. That’s the key; God will take care of every detail, so don’t be afraid, however big the ask might seem to you. God is in control. Mary was unique, but the message for us is the same, ‘Nothing is impossible with God’. Here’s a question to think about as we travel towards Christmas. What will it mean for me, if I follow Mary’s example and accept God’s will for my life?